xattr -w -x com.apple.metadata:kMDItemFinderComment "$hex" "$1"
Probably needs brew install tesseract xmlstarlet. 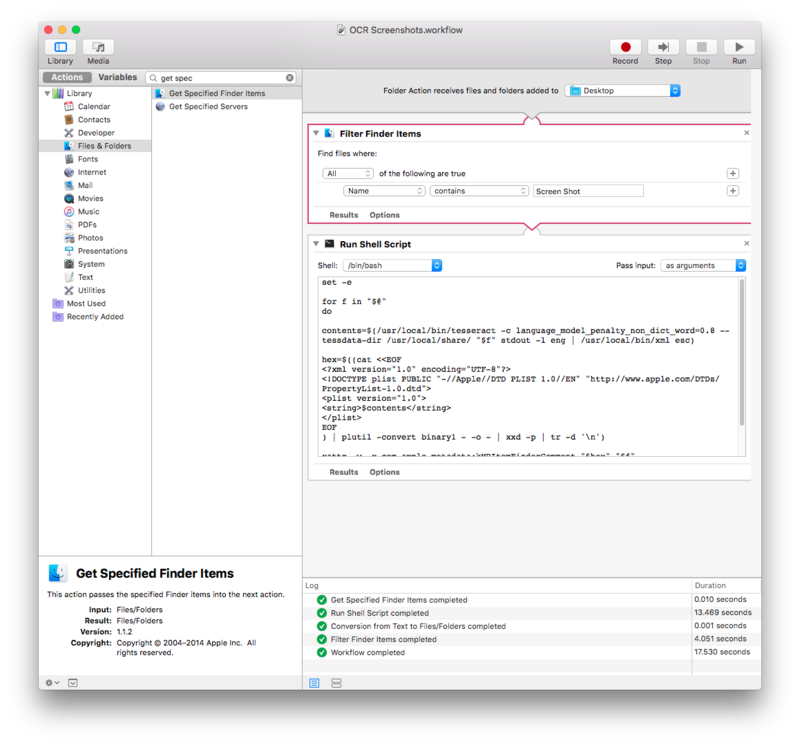 You can run this automatically for screenshots by enabling this Folder Action with Automator. The only tweak is to fully qualify the paths to tesseract and xml, since Automator doesn't know about your user's PATH. Testing with a screenshot of my Terminal, I got better results with -magnify than -adaptive-resize '200%x200%', but YMMV. @pnc @amake this is awesome!!! Just one thing, the search keyword must be localized for every language, so in Italian it would be "Schermata*", then it works! This is wonderful. Is there any reason not to run this on all image files on my machine? Are there drawbacks to carrying the extra extended attributes? @sclarke shouldn't be any downsides, only larger indexes (but not too daunting). For @amake tip you have to brew install imagemagick. And if you need other languages than englisch, you need to install brew install --with-all-languages tesseract and change the -l argument on tesseract. For example if you want to recognize english and german use l eng+deu. any plan to support ocr pdf files?